Lover of God,Seeker of Souls,Youth Pastor,Book Lover. “So when they continued asking Him, He raised Himself up and said to them, “He who is without sin among you, let him throw a stone at her first.”” John 8:7. Ask yourselves this question; are you free of sin?. Why then do you judge your neighbor? ; as the Lord left a commandment for you to love your neighbor as he loves you. We as human judge people by their appearances,actions,attitudes and etc…But are we really living the word of God as he lived it when he walk on this earth. Nowadays we judge and fight among each other for political views, religion and sexuality. Things that have no meaning you know why? Because if you put your life and family’s life in the Lord’s hands, you will be worry free and stress free as it says in Psalms 91:1 ” He who dwells in the secret place of the Most High, shall abide under the shadow of the Almighty.”I’m going to be straight; no one is going to have your same views, no one is going to have the same religion, or opinions. We were created differently, all of us have a different purpose on this earth. Some might be doctors, teachers, pastors, levites, or even scientist; but are we going to judge and criticize someone because they don’t think the same way you do.? No, you aren’t you are not God, you are not perfect, as human you make mistakes and you sin but if the Lord Almighty forgives and doesnt remind you or judges you of your sins;who are you to do it.? We are living these days like Pharisees( hypocrites) religious people that think that because you live a certain way, you are free to do whatever you want and let loose their tongue. Even though the tongue is one of the smallest members of the body is one of the biggest murder that we have in our body because with that member we can accomplish great evils or great virtues( James 3:1-12). Let’s try no to judge one another instead give love where is needed or where is not wanted. 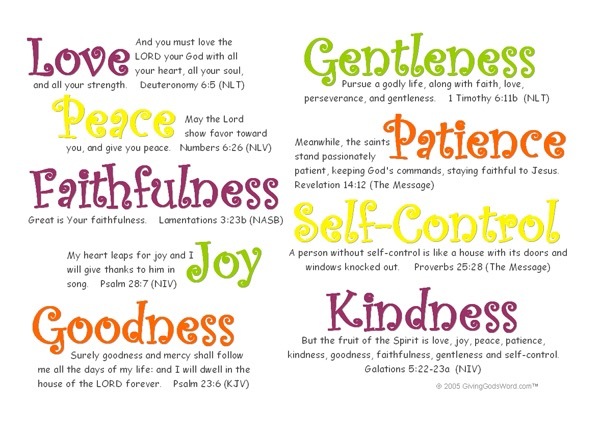 Because you have to give fruits of the spirit which are “love, joy, kindness,peace,long suffering,faithfulness,self-control and gentleness (Galatians 5:22-23).”God bless every single one of you each and every day. Hello everyone so this week I was pretty busy and I been struggling for a couple of weeks spiritually and what to write into this blog. On Friday we had nightwatch it was an incredible night the Lord’s presence was with us through out the night and today we took the youth bowling to spend time together as well to learn from each other.However that’s not what I want to talk about today. Have you ever read the story about the master who gave goods( talents) to his servants; to one he gave five, to another two and to the last one ( Matthew 25:14:30). I read it and have listened to my pastor and even different people preach about it and you know what. As teen when we read something like this, we end up with the question of what is it trying to say. I never really paid attention to it, I just read and listened to it but really didn’t focused on the meaning of that parable. But I have learned that each and everyone of us or you have a talent that the lord has given you. It could be in being a musician, playing the piano,guitar, cello or even singing( yes singing is a talent not a gift). Or it could be of praying,having charisma, grace, writing a blog or a book and a bunch of other stuff. 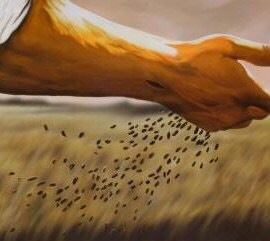 When we look at that parable and we read from verse 16 to 18 ; we see that two out of the three servants did something with their talent they multiplied those talents by the amount they were given; however one instead of multiplying that one talent he instead dug it into the ground and didn’t do anything about it. What are you doing with; what the Lord has given into to your keeping.? I know it’s hard sometimes to get up and try to do sometime in our lives with those talent. Most of the time we are afraid that because we are young we are unimportant, but I got news for you you are important in the eyes of God, you will always be important but try to do something with that don’t let it go to waste because if you dug it into the ground he will give it to someone else that will appreciate and work on it and then you will answers to God on that judgement day. God bless and have a nice evening. Author Ana GuerreroPosted on October 10, 2016 Leave a comment on Thoughts…? Sorry I haven’t written anything in a few days but, I been pretty busy with church and celebrating my mom’s birthday. Today I’m gonna talk about this book I’m reading it’s called “The Battle of Every Teenage Girl” by Shannon Ethridge & Stephen Arterburn; don’t worry there is one for young men too and it’s called ” The Battle of every Teenage Men” and it’s by Stephen Arterburn & Fred Stoeker. What can I say about it, well it makes me think about every inner struggle that some many young women go through including myself almost on a daily basis. It’s a refreshing book because it tells the stuff as it is there is no gray it’s only black and white. I’m just starting it but since the first page it confronts you with stuff that you might think is right to do and it shows you even explains the different reasons why is not. I suggest that if you are 12 years to older and you struggle with sexuality and you want to protect your mind and heart you should read it. It will give you what to help in those types of situation. Today my pastor was preaching about Jonah and how he ran away from the presence of God but at the end he did what God had order him to do; which was to take the word of destruction of Nineveh to them. And after he gave the word he got angry because, the Lord didn’t destroy the city and it’s people because they repented by everyone(including animals and livestock) doing fasting and prayer. Sometimes the same happens to us we want the Lord to do what we want but we don’t see the bigger picture that he has for us. Can you believe this prophet that God used tremendously but he was rebellious at times getting mad at God because he had given a word and later thought better of it and didn’t go through it because he saw the ignorace of the people from Nineveh. Author Ana GuerreroPosted on September 29, 2016 Leave a comment on The Why Question…..
Have you ever wonder what is my purpose in life? Why was I born in this century?. Well I got the answer for you, you were chosen before you were even a thought in your parents mind, he had chosen you since the beginning of time. He saw the that you would glorified his name and you will spread his word through the world. He chose you when he decided to send his only son to die for your sins. When the lamb was crucified on that cross and his side was stab so that his blood would run out and clean our sins. We will fall and we will doubt; we are humans after all and we are not perfect but don’t when doubt enters your mind; remember the sacrifice he made for your, for me and for everyone else. Author Ana GuerreroPosted on September 26, 2016 Leave a comment on You are CHOSEN!! Today was one of those days that it was hard for me in the spiritual sense actually this whole week. I seen what’s happening in the world, in my own state and I feel this deep sadness, because instead of looking for God; we search for answers with violence and ” two wrongs don’t make a right.” Dear readers it’s time for us to straighten our paths with the Lord. If you have read in Matthew 24:12 it says that ” Because of the wickedness in the world that the love will grow cold in people.” And also in James 4:1 ” What causes conflicts and fights among you? Don’t they come from the desire of battle( war) inside of you.” This is what are we seeing now days violence everywhere, the hearts of everyone is becoming colder. I feel this deep sadness for those souls because the solution is only to go back to the Lord’s way, why can’t they see that without him we are nothing; this country is nothing. We have disobeyed the word of our Father that he has given us. We have been more focused on the secular word and the pleasures of the flesh then spreading the word of the Lord to those lost soul that need a word that will touch their lives.